Our year so far at K-Woodlands………………..
Help us Send Max on a Journey of Hope! Cross Country Event is a Major Success! Friday Training Academy for 3-12 year olds – Book a place now – Or miss out! Sainsburys announce EKCT as local charity partner! 10% Off for Students at K-Park! 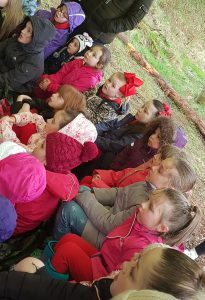 A great night was had by all at K-Woodlands on Tuesday 1st May where we welcomed over 100 Rainbows, Brownies and Guides from all around East Kilbride with their Group Leaders. As well as learning some basic first aid skills, the kids enjoyed making trails and fire-lighting. Despite the wet weather, the kids showed great resilience and got fully immersed in the activities and finished off with some toasted marshmallows and camp fire songs. Rebecca Montgomery says “The K-Woodlands Survival Skills session gave Girl Guiding units the opportunity to experience a taster session to their new upcoming program. The East Kilbride Community Trust prepared a fantastic session and all girls including leaders thoroughly enjoyed themselves. It was a wet evening but that didn’t interfere with the evening. A few girls said they would love to go back next week and “we had so much fun, can we do it over again”. The K-Woodlands staff member Tracy was fantastic with the girls and we look forward to working with Tracy and the Trust team again in the future!”. Well done to everyone involved in making the evening a success, the desired outcome of bringing the East Kilbride Rainbows, Brownies and Guides groups together was definitely achieved and K-Woodlands are looking forward to hosting The Forest Challenge Badge on Tuesday 4th September 2018 for all of Lanark.